Himachal Pradesh Chief Minister Virbhadra Singh today laid the foundation stone of the Rs 84.58-crore Lift Water supply scheme from Sainj Nallah to Village Gharog in Shimla district, 30 km from here today. 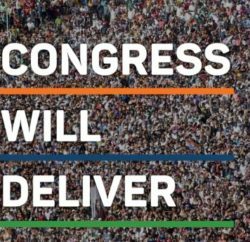 The scheme would benefit more than 50,000 residents of 618 villages spread over 29 gram panchayats, including Shakrah, Mehli, Dev Nagar, Dhami, Nehra and Ghanahatti of Shimla Gramin Assembly Segment. Chief Minister also laid foundation stone of Anganwari Bhawan at Gharog to be constructed at a cost of Rs. 4.5 lakh and laid foundation stone of Government Senior Secondary School Shakrah to be constructed at a cost of Rs. 4.50 crore. 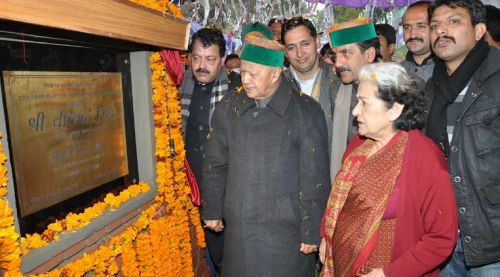 Virbhadra Singh also laid foundation stone of Science Block of Govt. Senior Secondary School Dhami to be constructed at a cost of Rs. 1.83 crore. Chief Minister also inaugurated Water Supply Scheme for Halog-Bathmana constructed at a cost of Rs 98 lakh. This would benefit over 2700 persons of the area. Addressing a rally at Dhami in his assembly constituency, Chief Minister said that although Shimla Rural constituency was situated nearer to the State Capital, but still it lacks several developmental infrastructures. He said that the State Government was committed to develop this constituency as a model constituency in matter of development. He said that the Government was also ensuring that all the constituencies would be given equal priority in matter of development irrespective of political considerations. In his address he also detailed out his budget presented only day before in Vidhan Sabha. He blamed previous BJP led Govt for financial mess and under estimating the committed liabilities of the State by the 13th Finance Commission. He said that even then he had presented a tax-free and growth oriented Budget for the year 2014-15. 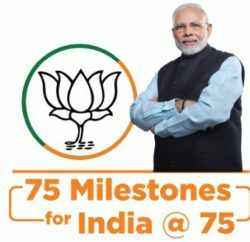 He said that the BJP Government opened colleges without any financial provision during the fag end of its tenure, but the present State Government during its present tenure has announced opening of 12 colleges, out of which 9 colleges have already been notified. He said that provision of Rs. 5 crore each has been made for creating necessary infrastructure for these colleges. Singh said an outlay of Rs 2,384 crore had been proposed for the Public Works department, which was nearly Rs 100 crore more than the current year’s allocation of Rs 2,291 crore. The budget for education has also been hiked to Rs 4,282 crore as compared to Rs 3,836 crore of current financial year, CM added. Virbhadra Singh said that the State Government was committed towards the welfare of its employees and pensioners. He said that the daily wages has been increased from Rs 150 to Rs 170 and 10 per cent Dearness Allowance would be provided to all the State Government employees and pensioners. Pensioners were also given added advantages in this budget. The CM said in order to boost industrialisation his government had decided to set up HP Investment Promotion Cell and Industry Advisory Council. State-of-the-art industrial zones would be developed at Pandoga in Una district and Kandrori in Kangra with an investment of Rs 219 crore. 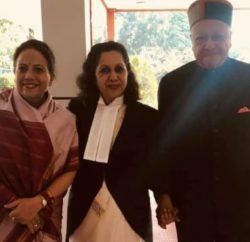 He said it had been purposed in the Budget that any new industry employing more than 300 Himachalis would be charged only 2 per cent electricity duty for five years. Besides existing small industry would have to pay electricity duty at a reduced rate of 7 per cent and new unit to pay only 2 per cent for five years, he added. Irrigation and Public Health Minister Vidya Stokes, Deputy Commissioner Shimla Dinesh Malhotra, SP Shimla Shimla Abhishek Dullar, Engineering-in-Chief IPH R.K. Sharma, Director Higher Education Shashi Bhushan Shakri and other prominent people of the area were present on the occasion.